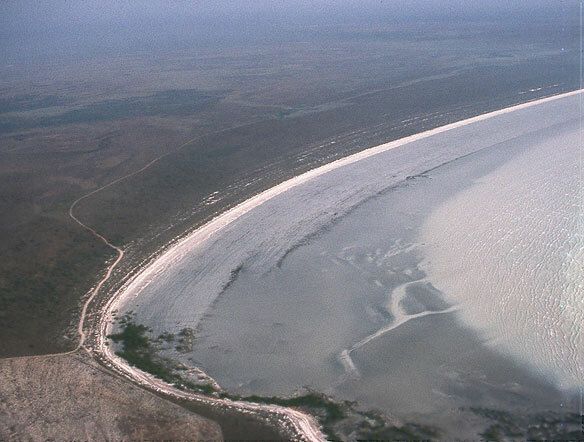 View of the northern end of Eighty Mile beach at Cape Missiessy showing the wide ultradissipative beach at low tide with the low tide flats extending 100 ‘s m offshore and mangroves fringing the cape shore. Eighty Mile beach is one of the three longest beaches in Australia extending for 222 km from Cape Keraudren in the south to Cape Missiessy in the north between latitudes 19-20°S. The beach is located across in the Canning Basin a 400 000 km2 sedimentary basin that has been infilling since the Ordivician. The beach is located in the arid northwest of Western Australia and has a hot dry desert climate with rainfall less than 400 mm per year, with temperatures averaging over in the 30°C during summer. The beach is however exposed to summer tropical cyclones, which tend to track down the coast usually crossing at cyclone alley just south of the beach between Onslow (20°S) and Port Heland (21°S). Cyclones do however make landfall along the beach and in the past they have wiped out the pearling fleet, which used to operate along the coast. The beach is exposed to macro-tides up to 7 m, with waves usually low owing to the predominately offshore westerlies. The low waves, high tides and fine to medium carbonate (80-96%) sand maintain a well developed ultradissipative beach morphology. At low tide it is possible to walk hundreds of metres out across the low tide flats. The beach and flats do however produce an abundance of shells, and people come to visit the beach just to collect shells. The beach is backed by a series of well-developed foredune ridges, which in the south have been activated into a transverse dune field. A series of eight tidal creeks also cross the beach, which in some places is also interrupted by beachrock outcrops. The only development on the beach is the Eighty Mile Beach caravan park, located towards the centre behind the foredune. Pastoral properties carrying sheep back some of the beach, and in the south at Cape Keraudren is an informal camping area very popular during the winter months. The North West highway runs 20-30 km inland.